Thycotic’s survey of attendees at the 2017 Black Hat Conference in Las Vegas reveals what cybersecurity technologies hackers think are obsolete; plus, the easiest and fastest ways they use to get at your sensitive data. 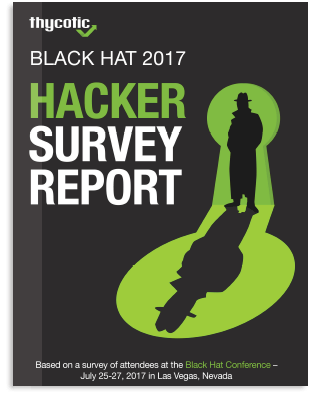 Join Thycotic’s Chief Security Scientist as we cover the top takeaways from this years’ Black Hat conference and our just released Black Hat 2017 Attendee Survey Report. Educating all key stakeholders on the fundamentals of cyber security. Taking a people-centric approach to cyber security that prioritizes ease of use and less complexity. Implementing Multi-Factor Authentication for emails and all sensitive privileged accounts. Enabling encryption to protect user credentials and privacy. Automating the management and security of privileged accounts. Thycotic Secret Server gives you the simplest, easiest and most affordable way to discover, secure and manage privileged account passwords across your organization. Thycotic Privilege Manager for Windows protects endpoints from malware and enforce least privilege policies to shield applications and systems from malicious access.